In the midst of pouring rain in the Cajun Dome, ULL found a way to pull out a victory Saturday night. After the Warhawks put on a convincing performance the first half, they had no answers for the Cajuns in the second. Coach Todd Berry said he felt the team gave it their all, but mistakes cost them. “Lafayette came back after the second half and they executed better than we did, and so consequently, they won,” Berry said. The start wasn’t ideal for ULM after Marcus Green fumbled the opening kickoff setting up ULL on the Warhawk 21-yard line. ULM held ULL to a field goal, which they booted in from 40 yards out to take the 3-0 lead. 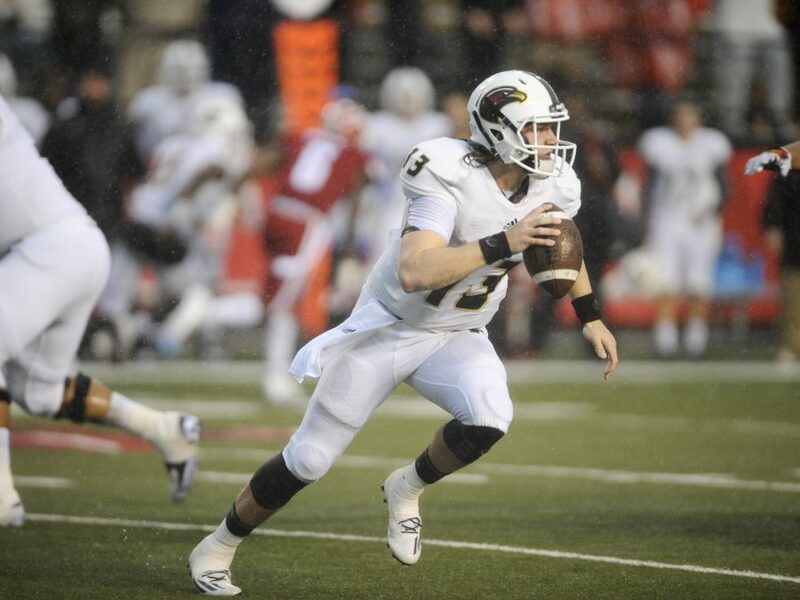 After the less than desirable start, the Warhawks rebounded their next drive. Quarterback Garrett Smith found wide recievers Marcus Green and Ajalen Holley multiple times to drive it methodically down the field. After 11 plays, Smith found Green for a 27-yard touchdown reception and the Warhawks took the lead 7-3. A short punt by the Cajuns gave ULM great field position their next drive and the team capitalized. After their opening three plays resulted in a loss of yardage, ULM decided to go for it on fourth down. The gamble paid off and Smith found Holley for a 29-yard score and his second touchdown of the night. The ULM defense proved stout on ULL’s next two drives, and the Cajuns were forced to settle for field goals. With the score at 14-9 ULM, the Warhawks struck again. After Kaylon Watson ran it seven yards on first down, he found the house on second. Smith threw it to Watson who was streaking down the sideline and he proceeded to go the distance for a 53-yard touchdown play. The Warhawks weren’t done scoring in the first half yet and put together a long field goal drive to cap off the half. ULM would go into their locker room with a 24-9 half time lead and a large descrepancy in yardage. 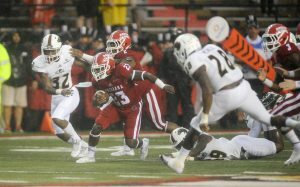 While ULL held a slight 20-yard advantage on the ground, ULM dwarfed the Cajuns through the air with a 189-24 yard edge. The third quarter began with a solid ULL march down the field for their first touchdown of the night. Going into the fourth, ULM was holding onto a narrow 24-16 lead. The Cajuns offense would explode to push them over the top. ULL quarterback Brook Haacks found the endzone to pull the Cajuns within two. A failed two-point conversion attempt over the middle of the endzone failed. Later in the quarter with ULM up by two, Haack found Jamal Robinson for a 64-yard strike to put the Cajuns up for good. ULM would have one last chance to retake the lead but Smith fumbled it on third to conclude the ULL victory. “This is not the same team we started off with, and guys have had to grow up. It’s frustrating to get so close,” Berry said. ULM takes on Troy next Saturday.